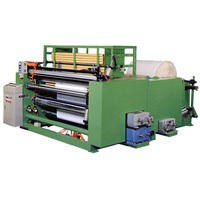 Automatic rewind line is a complete, integrated system that produces a wide variety of products. Easy production process. All perforation, slitting, rewinding, trim and tail sealer completed in one machine. Specific design of spiral perforator very low noise and long service life. Option Equipment: Single / Double / Edge Emboss Section & Flexo-Printer and Variety of equipment on rewinder.